"the normal force per unit area exerted on a imaginary or real plane surface in a fluid or a gas"
1) In the Imperial - English Engineering System special care must be taken for the force unit. The basic unit for mass is slug and the unit for force is pound (lb) or pound force (lbf). The absolute pressure - pabs - is measured relative to the absolute zero pressure - the pressure that would occur at absolute vacuum. All calculations involving the gas law requires pressure (and temperature) to be in absolute units. Atmospheric pressure is the pressure in the surrounding air at - or "close" to - the surface of the earth. The atmospheric pressure varies with temperature and altitude above sea level. 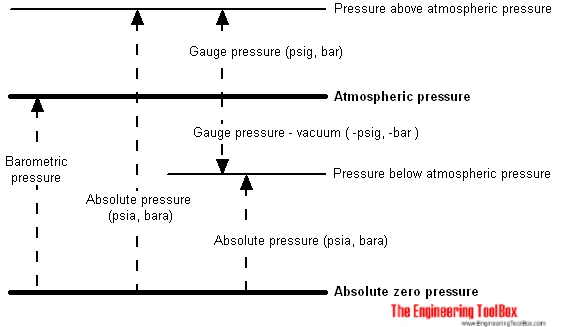 The Standard Atmospheric Pressure (atm) is normally used as the reference when listing gas densities and volumes. The Standard Atmospheric Pressure is defined at sea-level at 273oK (0oC) and is 1.01325 bar or 101325 Pa (absolute). The temperature of 293oK (20oC) is sometimes used. In imperial units the Standard Atmospheric Pressure is 14.696 psi. Since 1 Pa is a small pressure unit the unit hectoPascal (hPa) is widely used, especially in meteorology. The unit kiloPascal (kPa) is commonly used in the design of technical applications - like HVAC systems, piping systems and similar. A torr (often used in vacuum applications) is named after Torricelli and is the pressure produced by a column of mercury 1 mm high - equals to 1 / 760th of an atmosphere. Pounds per square inch (psi) was commonly used in the U.K. but is now replaced in almost every country except in the US by SI units. Since atmospheric pressure is 14.696 psi - a column of air on a area of one square inch area from the Earth's surface to the space - weights 14.696 pounds. There are 1000 millibar (mbar) in one bar, a unit common in meteorology and weather applications. Engineering ToolBox, (2004). Pressure. [online] Available at: https://www.engineeringtoolbox.com/pressure-d_587.html [Accessed Day Mo. Year].